Tales from the Tiny Kitchen: Choc Air flies back to Wales! If you happened to be at last weekend's Green Man music festival mucking around in the Welsh mud, you might have purchased a delicious chocolate brownie from a lady dressed up as a retro-style 1980s air hostess. She was glowing with very orange fake tan and frosted eye makeup, and carried an usherette box and an oxygen mask. That person was me - thanks to all of you who tapped me on the shoulder(pad) and bought dark chocolate or salted caramel brownies, and white chocolate blondies with pecan nuts...and Choc Air salutes all of you who came over and bought all three flavours in one go! This year was Choc Air's second flight (last year's Green Man festival having been my debut) and it was even more fun because lots of festival-goers recognised my garish get-up from last year's event. Nothing quite like a gimmick to shift those cakes, that's what I say! Yet again, I had a lot of requests for brownies containing hash - sorry I had to disappoint y'all! Quite frankly, who in their right mind would sell hash cakes dressed so conspicuously? Especially since a lot of my customers were nine-year-old kids demonstrating pester power...although I'm sure that this might have calmed them down instead of my 'non-special' brownies whipping them up into a sugar-induced frenzy. Choc Air will be flying again soon...I have a potential invite to take my usherette box to a friend's warehouse party in September, which am I very excited about...he might even let me loose on the decks! Is your seat in the upright facing position? Would you like any duty free? Want the brownie recipes? Find them here. Oh you utter MARVEL. *applause* Awesome! 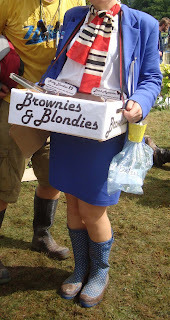 I was lucky enough to purchase one of those brownies - delicious! I will certainly be flying Choc Air again.